Proclear Toric contact lenses are produced by CooperVision and have a monthly replacement schedule. These lenses are suitable for those with astigmatism and sensitive or dry eyes. Their patented PC technology ensures enhanced moisture and comfort. 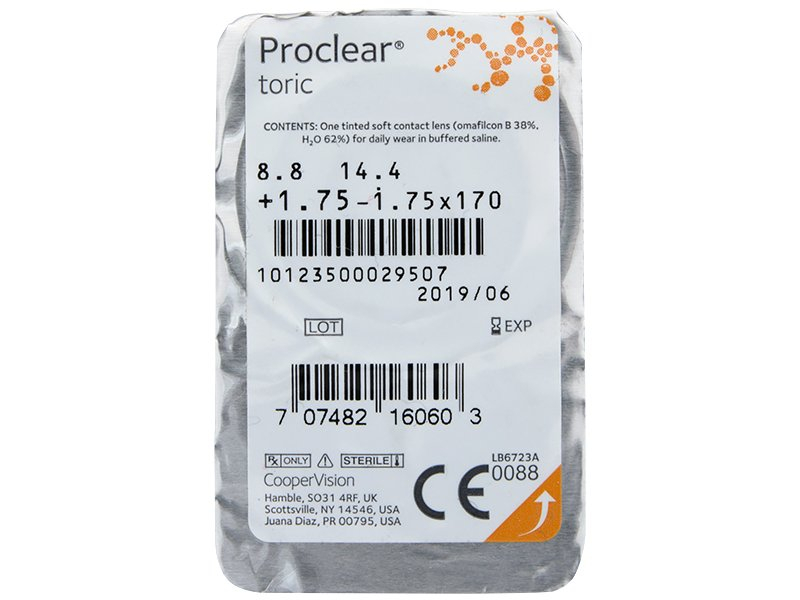 Proclear Toric are soft, monthly contact lenses manufactured by CooperVision for the correction of high levels of astigmatism. This package contains three lenses, and the producer does not recommend overnight wear. 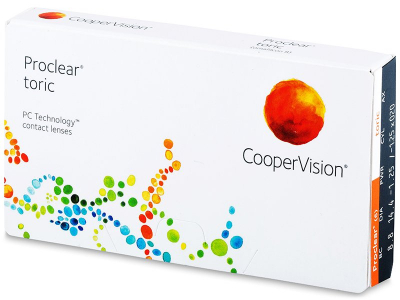 The patented PC technology offers all-day comfort and outstanding quality of vision. Their specific material composition makes these contact lenses very suitable for users suffering from dry eye syndrome. Compared to other soft lenses, Proclear Toric contact lenses retain triple the amount of water. This is especially helpful for users who spend long hours working at a computer or in air-conditioned environments. Really notice the difference with these. Dry eyes aren't really an issue for me when I wear them. If i ever get dry eyes it's towards the end of the day and I just put some eye drops in and im good. 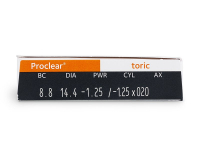 How do I specify an N type lens with a +2.50 add. Hi, Chris, Thank you for your recent comment. Our toric lenses don't come with any high or low powers – simply select your power from the dropdown menu!